So coming off one of their most impressive wins of the season Thursday in breaking the New York Knicks’ 13-game winning streak, the Bulls marched into Canada and found the same indifference, indecision and incompetence that U.S. generals experienced two centuries ago in a series of ignominious defeats and surrender. Though it probably took those American troops less time to get home not having to go through Canadian customs. Just like 1813 when the Americans couldn’t hit anything, either, even losing Fort Dearborn, later the city of Chicago, to Native American allies of the British and Canadians. Yes, the Bulls were sort of in there after trailing by double digits most of the third quarter. They were within three briefly early in the fourth quarter before yet another Toronto fast break score (23-6 Raptors’ fast break edge) opened up a game with the lackluster Bulls effort you never felt they would or could make a run. Jimmy Butler had just seven points in 36 minutes. Nate Robinson did add 17 points and was three of five on threes to support Boozer’s overall 19 points and 12 rebounds and 16 points and 13 rebounds from Nazr Mohammed. But the Bulls were several steps behind and astride pretty much all game as perhaps the symbolic turning point was about three minutes into the second quarter when Aaron “the tortoise” Gray had an uncontested dunk. Yes, it was so bad no Bull was even close enough to be an Aaron Gray poster. Though you’d never much live that one down. Perhaps this sort of game was inevitable after the emotional home overtime win Thursday on national TV, Joakim Noah and Taj Gibson still out injured, it being the third game in four nights after a late arrival in Toronto and with Richard Hamilton ejected for a flagrant foul late in the third quarter and Boozer in foul trouble and eventually fouling out after 31 minutes as Mohammed had to play just under 43. But the games count nonetheless, and the Bulls now count themselves sixth in the Eastern Conference at 43-36, a half game behind Atlanta. The Bulls hold the tiebreaker and the two teams are tied in the loss column, though both are guaranteed to open the playoffs on the road. But the Bulls are in Miami Sunday in a revenge game of sorts for the Heat. Should the Bulls finish sixth in the East, they would open the playoffs in Indiana, the only team among the top five in the East against whom the Bulls did not have a winning record. Though the sixth seed potentially avoids Miami until a conference finals, the Bulls would presumably have a much tougher first round series with a Pacers’ team that plays similar defense and is healthier and perhaps be a first round playoff victim for the second year in a row. 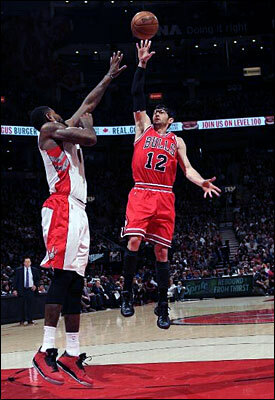 Once again against a Raptors team that is 31-48, the Bulls were badly outplayed and looked outclassed. You almost couldn’t believe watching the two teams this past week the Bulls had the better record. Toronto is far more athletic and seems more talented with Rudy Gay and DeMar DeRozan racing down court for 23 points for Gay and 19 for DeRozan, the latter against whom Hamilton was ejected for what was considered a flagrant elbow to the head. Hamilton is generally not known as a dirty player, and he said he was just trying to clear space and was surprised by the ejection. But there certainly was frustration among the Bulls as they watched the Raptors long layup and dunk line. Amir Johnson had 24 points and even dropped a long three with the Bulls weak at contesting, slow to get back, indifferent about helping and seemingly already with one foot in South Beach, where they were due to arrive early Saturday morning. Point guard Kyle Lowry had 13 points, 11 assists and nine rebounds and the Raptors were just the latest in a line of good shooting teams to hit the target against the Bulls with better than 47 percent accuracy. The Bulls have lost three of their last four to lottery teams and are just 9-7 the last two months against Eastern Conference lottery teams. Overall, they are 16-14 against losing teams. The Bulls like to feel they just don’t get up for poor teams as evidenced by recent wins over the Knicks, Heat, Nets and Pacers. But what it suggests more, especially with Noah and Gibson out, is the Bulls are good enough to win a game against a good team. But they are not good enough to win a series as they have difficulty sustaining anymore after a long streak when they rarely lost even back to back. Over their last 32 games, the Bulls are 14-18 and for the most part stumbling toward the playoffs with now three games remaining in Miami, Orlando and home Wednesday against the Wizards, the latter who’ve won the last two between the teams. Perhaps it will mean a return for Gibson or Noah, though being the first of a back to back it seems doubtful either would return to play two straight. It seems unlikely the Bulls can get much continuity going toward the playoffs as Thibodeau has continued to employ emergency and hybrid lineups and rotations to get through these final weeks. 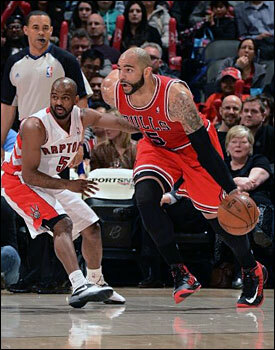 The Bulls started off well enough with that big lead behind Boozer’s jump shooting. But it vanished quickly in a harbinger of events to come with dunks and layups off turnovers and long misses and the Raptors got within 22-20 after one quarter. Buddies Robinson and Hamilton off the bench got things going a bit in the second quarter. But Toronto closed the half with a rush and more uncontested dunks for a 47-43 lead. They got on a run after halftime behind Johnson, another of the too athletic Raptors, with inside moves and beating the Bulls down court. Thibodeau had an early timeout that went unavailing. Toronto quickly went up 10 and was ahead 69-56 when Butler and Robinson dug into the lead with threes. The Bulls quickly got within four, but Toronto again stretched out to 73-65 after three quarters behind yet another Gay runout. Yes, those threatening Raptors who had lost 15 of 21 before winning their last two, both over the Bulls. The Bulls are the first winning team the Raptors have beaten since Feb. 22. The Bulls looked like they might steal it opening the fourth with Robinson and Butler combining for a runout score and dunk. But when it seemed the Bulls just had to put together a few minutes of defense, Gay ran out after a Marco Belinelli lazy pass turnover and then dunked after a Bulls three second violation and no one much worrying about being back too quickly. That got Toronto back up 78-71 with 8:09 left. Robinson hit a floater going at fellow little guy John Lucas. But again the Bulls couldn’t restrain or retain the Raptors’ offense as Johnson dove in for another dunk and then Johnson made the seventh three pointer of his career for an 85-76 lead with 5:55 left. Toronto then went inside and around as the lagging Bulls could just reach and send them to the free throw line to close the game out. And like their American ancestors, who in one infamous battle in 1813 were firing at one another in a campaign that one observer of the time said produced “disaster, defeat, disgrace, and ruin,” the Bulls evacuated Canada with little to show for their efforts as timid as they were.